Billed as the episode’s lead guest, Harington will support the April 14 “Game Of Thrones” season premiere. The “Fallon” visit additionally precedes his April 6 “Saturday Night Live” hosting stint. In the decade since Kit Harington was cast as Jon Snow in HBO’s Game of Thrones, he’s had to do almost everything. Everything, that is, except smile. “I have played possibly the unfunniest character ever to have graced television,” he says. So it’s fitting that as he says it, sitting in his London home, he’s laughing. He’s happy because he’s mid-run in a Sam Shepard play, True West, where he gets to wear his hair short and shave off that beard. He’s happy because his wife of nearly a year now, Rose Leslie, is upstairs rehearsing for her role in CBS All Access’s The Good Fight. And he’s happy because the whole world is about to see the eighth and final season of Game of Thrones. It debuts April 14, and he can’t wait. He’s read all the scripts, of course, making him one of the hundred or so people in the world who know exactly what will happen. 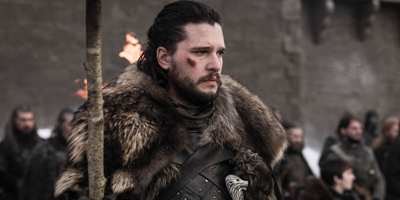 He hasn’t told anyone — “not even Rose,” whom he met on the series (she played Ygritte, with whom his character had a brief, ill-fated fling).